The digital world offers opportunities and benefits to all of us as individuals, professionals and businesses. It connects us, empowers innovation and permeates what seems like every aspect of our lives, yet the demand for digital skills continues to outstrip the supply of talent among workforces. In January, Damian Hinds addressed the growing digital skills gap in his first public speech as the new Education Secretary, advising that schools need to prepare young people for the digital revolution. As well as traditional academic subjects and public speaking skills, digital literacy is high on the agenda as it continues to prove a fundamental requirement in a high proportion of new jobs. EY and Tech North also highlighted the ‘significant’ digital skills gap in the North of England recently. A report that examined the Northern Digital Jobs Strategy stated that 712,750 digital tech vacancies were posted over the past three years, but they are more likely to remain unfilled compared to other industries – despite the average salary being 48 per cent more than the median across the board. This increased media attention only cements the importance of digital when it comes to climbing the career ladder, as well as getting onto it in the first place. Schools and employers will need to play a key role in bridging the knowledge gap and by equipping the next generation workforce with a better understanding of the benefits of digital, and businesses will reap the rewards of this too. So, why should students, young professionals and businesses support the call for better skills and acquaint themselves and their employees with digital? Digital doesn’t only provide opportunities for career development – the financial rewards are attractive too. The average digital salary in the UK is close to £40,000 and there are currently over 350 jobs available in the UK with a salary of over £60,000, which has grown considerably over the last year alone. The head of digital marketing at a business can expect to earn between £60-80,000. In the current job market, the demand for digital skills has never been higher – the skills are no longer a desired trait, they’re a necessity of working life. As we’ve already learnt, employers are prepared to pay more if you can differentiate yourself from those who have a limited knowledge of digital. Knowing how to boost your online presence will help to reinforce your skills, your brand and your business, plus what you offer to your audience – whether that’s as an employer, client or consumer. 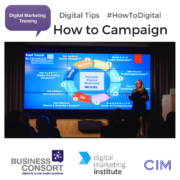 For businesses, having the in-house skills to build a digital marketing strategy will enable you to reach more people, generate more leads, convert more sales and help to portray exactly why you or your business is great. It is proven that investing in digital skills will help productivity, innovation and profitability. If you’re an individual looking to climb the career ladder, upskilling with digital will not only boost your efficiency, it will also give you the motivation you need to achieve results and progress. If you’re a business, providing digital training will have a multifaceted benefit – you will boost employee output, improve retention and keep morale high because of the investment you’re making in your team. If you or your employees want to take advantage of the promising digital future, expand your knowledge or implement a digital marketing strategy that will elevate your business, we have courses available in London, Manchester and online.